HiTech is a humanoid arthropod alien who served as Lord Dregg’ssecond in command in the ninth season of the 87’s TV series. Just as his name applies, HiTech is heavily armed with advanced alien armor and weaponry, but is sometimes seen without his heavy gear. 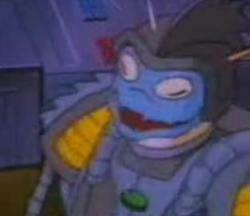 Extremely loyal to Dregg, he has assisted him with his every plan to conquer Earth and destroy the Turtles throughout the season. However, in the first episode of the tenth season, The Return of Dregg, Dregg’s other subordinate, Mung, had proven himself to be more useful than HiTech. Therefore, Dregg decided to make Mung his second in command instead, and disposes of HiTech for good. Having been sent off into deep space, HiTech has never been seen ever since, and has probably the most tragic exit of any villain in the Ninja Turtle series compared to Baxter the Fly.